Forestry and farming generate more than 30 percent of all the world’s greenhouse-gas emissions, mostly because land managers are pinching pennies to meet our own appetites for soy, beef, and palm oil. These rural Indonesian farming districts say they can manage the land more sustainably, but agribusinesses will have to share the risk. Will they? 6 November 2018 | Beni Hernedi loves mountain-climbing, and he bristles when people dismiss his passion. Those habits got him elected vice regent, or Vice Bupati, for the administrative district of Musi Banyuasin, in South Sumatra, Indonesia, where he developed his current passion: sustainable development. It’s a calling he received during the 2015 wildfires that left swathes of his district in cinders and filled the lungs of people as far away as Singapore and Malaysia – where, ironically, many of the companies responsible for the devastation were located. Indonesian attorney Gita Syahrani agreed, and today the two are among the leading force of something called the Sustainable Districts Association (Lingkar Temu Kabupaten Lestari in Indonesian, or “LTKL”), which unites administrative districts that are scattered across Indonesia in a coordinated effort to better manage their forests, farms, and fields. Research shows that these activities can get the world 37 percent of the way to meeting the Paris Climate targets, but they attract just 3 percent of climate finance. The LTKL aims to bridge the funding gap by creating districts that can attract investment capital – in part by establishing long-term uptake agreements with companies that want to comply with the Sustainable Development Goals (SDGs), which the United Nations created in 2015 to drive finance into clean development. 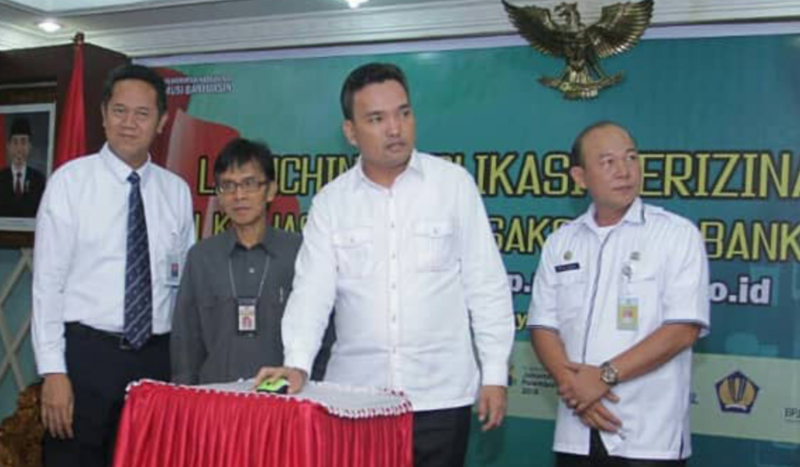 Beni Hernedi (center) launching an online licensing portal in the district of Musi Banyuasin. The 193 countries of the United Nations General Assembly adopted the SDGs three years ago – on September 25, 2015 – three months after the wildfires had begun engulfing Southeast Asia and two weeks after South Sumatra had declared a state of emergency. It was the lead-up to the year-end climate talks in Paris, and Indonesia had already pledged to reduce its greenhouse gas emissions by slowing deforestation – a pledge that was formalized in its climate action plan, or Nationally-Determined Contribution (NDC) to the climate challenge when the Paris Agreement was adopted in December. That’s when he learned of another initiative that had begun one year earlier – the New York Declaration on Forests (NYDF), which is a non-binding agreement to cut the global rate of deforestation in half by 2020 and end it by 2030. The NYDF focuses on four commodities responsible for most of the world’s deforestation – namely, beef, soy, palm oil and pulp & paper. Indeed, three of the NYDF signatories – Golden Agri, Musim Mas, and Wilmar – were located in Singapore, while one was in Malaysia (Sime Darby), one was in Indonesia (Asian Agri), and all had interests in or near his district. More importantly, all five of these regional players were members of a global sustainability network called the Tropical Forest Alliance 2020 (TFA2020), which was created to help businesses, governments, and non-governmental organizations (NGOs) meet the 2020 targets. Hernedi started attending regional meetings, where he learned that TFA 2020 had scheduled its first General Assembly for March, 2016, in the Indonesian capital of Jakarta. There, he found other Bupatis who shared the same goals – and faced many of the same challenges. 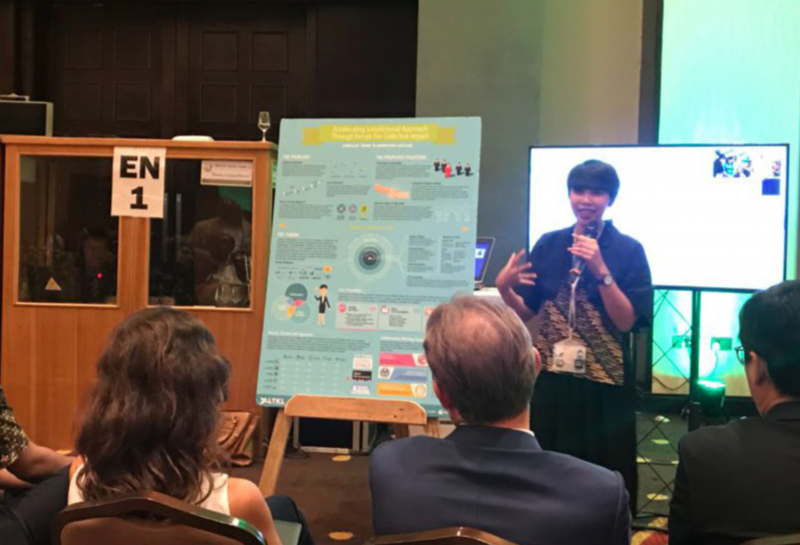 Gita Syahrani (right), leading a workshop at the most recent TFA 2020 General Assembly in Accra, Ghana. Indonesia’s Bupatis often get blamed for the country’s rapid deforestation, which kicked in after the fall of President Suharto in 1998. Authority over forests was then decentralized, so Bupatis started granting forest-development concessions to fund their local economies and, sometimes, line their own pockets. The 2015 fires, coupled with the advent of the SDGs and the Paris Agreement, may have sparked an awakening among some, but sustainability-oriented Bupatis found themselves in a quandary. In a forested rural economy, the challenge of sustainable development becomes a challenge of sustainable agriculture and forest management – which requires changing practices and managing expectations. When Hernedi met Syahrani in 2016, she was working as the World Resources Institute’s (WRI) Sustainable Commodity & Business Manager for Indonesia – a position she’d taken after acting as the private-sector liaison for the National REDD+ Agency, which was a body tasked with helping the country dock with international climate agreements around forestry. It didn’t, however, feel like goodbye, as the conversation swirled around the endless possible linkages between district green growth plans, the country’s climate change strategy, and global demand for deforestation-free commodities. The next day, Syahrani got a call from Hernedi asking if they could keep the conversation going. Syahrani floated the idea with three organizations: the Sustainable Trade Initiative (IDH), the Indonesia Palm Oil Smallholders Association (SPKS), and the Indonesian Association of District Governments (APKASI) and found enough support to arrange a two-day workshop in December, 2016. The districts, it turned out, had well-developed but extremely varied development programs. Indonesians have a word for that kind of balance: “lestari”, which means “keeping things as they are” but implies balance, preservation, and sustainability. They quickly settled on a name: Lingkar Temu Kabupaten Lestari. LTKL was formally incorporated in partnership with APKASI by July 2017 and Syahrani formally switched gear to head the LTKL Secretariat. By September, 2017, LTKL participated in its first TFA 2020 Implementation Dialogue. There, Hernedi was one of the key speakers, providing an opportunity to learn directly from global trading groups what companies need from – and can offer – the districts. That dialogue has since led to trial purchases from smallholders, and a subsequent meeting led to cooperation on fire prevention in peatlands. Meanwhile, his district has found synergies with several other districts – most notably the district of Sigi in Central Sulawesi, 70 percent of which is protected forest that must be conserved. Learning from Sigi, Hernedi has also set up a specific task force to help his district deal with agrarian reform and agrarian conflict resolution – a critical building block before any investment to further support sustainable development can start flowing. In parallel, LTKL has also helped Sigi and other members get involved in national discussions on better fiscal policy to support sustainable districts. LTKL is hardly alone. Mayaysia’s Sabah Province is well on the way to becoming a sustainable jurisdiction, and IDH is working with several other provinces across Indonesia, while Brazil’s Green Municipalities are striving to attract international companies that have pledged to purge deforestation from their supply chains. In each case, local people and authorities have bet on those companies keeping their promises, and now the question is: will they? Steve Zwick is Managing Editor of Ecosystem Marketplace and produces the Bionic Planet podcast. Before joining Ecosystem Marketplace, we covered European business for Time Magazine and Fortune Magazine and produced the award-winning program Money Talks on Deutsche Welle Radio in Bonn, Germany.